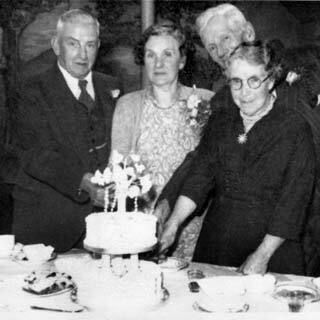 Code no CT185: Dorothy Smith explains how her grandparents, Samuel and Emma Fielden, left, came to celebrate a double Golden Wedding with Jack and Mary Stevenson, right, in 1956. Regarding the laying of the corner stones at Lanebottom Chapel, Walsden (issue 9): one was laid by my great great grandmother, Margaret Dawson. The double golden weddings referred to was in 1956, celebrating the marriages of Samuel Fielden to Emma Walton, and Jack Stevenson to Mary Walton at Lanebottom chapel in 1906." Can you help with queries about local newspapers, the Lord brothers of Todmorden and the Temperance movement? Please note: Whilst we are happy to include queries, "Milltown Memories" is unable to undertake research of any kind on readers' behalf.